The Wabbit was at his laptop attending to his lists - a task for which he had tried several systems. Usually he tried to have umpteen windows open and exchange items at will. But on this occasion he had decided to download a program called ListWrite Light. This had proved colourful yet less than helpful. He now had the exactly the same lists but they were prettier. 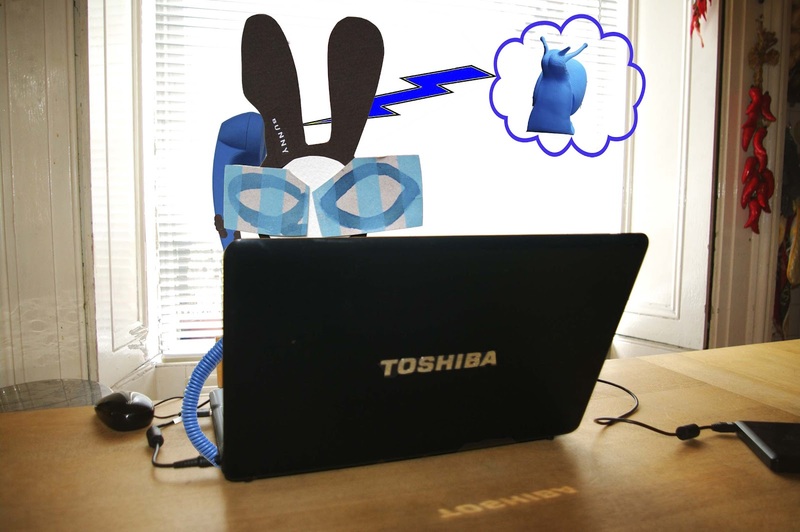 "Grrr," thought the Wabbit and he jabbed furiously at the laptop keys and tried to uninstall the program. But just at that very moment the Snail Phone rang and the Wabbit grabbed it with a paw. "Oh, hello Snail," said the Wabbit brightly, muttering, "make it quick!" under his breath. "I heard you," said Snail. The Wabbit had forgotten that the Snail Phone was a sensitive device that could hear his thoughts and he silently cursed the new technology that he and Big Blue Snail had developed in a shed. "We cannot fly in the face of change," said Snail. "I suppose not," said the Wabbit, “so what’s new, what’s true?" "I'm relaying a secret message from the Department. Your mission is to retrieve some lost data and for that you must be miniaturised." "I’m a wabbit not a scale model," said the Wabbit. "Prepare to download the program," sighed Snail, "and I’ll be seeing you." The Wabbit's paws started to vibrate and he watched as his laptop got bigger and bigger. "It's not the laptop, it’s you," said Snail's voice from the phone. "I don’t want to be miniaturised," said the Wabbit. "It’s just for an hour," said Snail. "Not even for a second," yelled the Wabbit. "Honey I shrunk the Wabbit," smiled Snail and the line went dead.